If you can bear to leave Coulscott there are tonnes of places to visit and things to do. Perfectly situated two miles from Exmoor’s Heritage Coast with spectacular views across a privately owned valley, Coulscott is less than a mile from the village, the Tarka Trail and the South West Coastal Path. Within the 12 acre grounds available to our guests there are many tranquil areas where one can sit and read or just simply relax and take in the stunning views. The village, famous for having the longest High Street in the Country boasts 2 small supermarkets, cash points, petrol stations, post office, garage, chemist, bakery, a fish and chippy and numerous eateries some overlooking the beach and harbour. Coupled with the many fetes, carnivals and colourful events that take place throughout the summer you will find plenty to occupy your time if so inclined. Spectacularly beautiful, awe inspiring, Exmoor and just half a mile from our gates! With over 700 miles of footpaths and bridle ways, tumbling waterfalls and rivers, heather topped hills the Park looks beautiful whatever the time of year. The Victorians christened it Little Switzerland and as you travel through it is possible to see wild ponies, birds of prey, red deer and ancient horned sheep amongst other things. Situated in an area of Outstanding Natural Beauty there are excellent beaches such as Woolacombe, Croyde and Saunton as well as many other visitor attractions just a short car ride away. North Devon has a fantastic coast line ranging from the highest cliffs in England to what is said to be the country’s best beach. Hele Bay – Close – Dogs OK.
Sandymouth Beach – Good for sports. Beware of currents. Dog access restricted May – September. Near Bude. Sandymouth Beach website. Lee Bay – No dogs. Loos and tearoom in season. Near Lynton. Lee Bay website. Putsborough and Woolacombe – Dog access restricted to May – September. Dogs can go between the two beaches. Very good for sports. Woolacombe website. Bucks Mills Cove – Near Bidiford – Usually quiet. Saunton Sands – 3 Miles long – Food available all year – Dogs permitted. Saunton SandsWebsite. Clovelly – Cobbled, traffic-free private fishing village. Clovelly Visitor Centre, Near Bideford, EX39 5TA Tel: 01237 431 781 . Clovelly Website. Lynmouth Beach – Dogs OK. Lynmouth Website. May Spring Bank Holiday ( 4 days from Friday to Monday evening) – Over the four days of the Spring Bank Holiday weekend, the Grenadiers, Hobby Horse, Fool and villagers hunt through the village for the ‘Earl of Rone’, finally finding him on the Monday night. The hunt starts on Friday evening around the village, Saturday is the juniors day, led by children from Combe Martin School. The hunting continues on Sunday afternoon with the addition of a band. Monday evening sees the last hunting when the Earl of Rone is finally captured. He is mounted back-to-front on a donkey and paraded through the village accompanied by hundreds of villagers, reaching the beach at sunset. He is frequently shot by the grenadiers and falls from the donkey only to be revived by the Hobby Horse and Fool, re-mounted on the donkey and carried onwards to his fate. At the final shooting on the beach, he is not revived but thrown into the sea. In addition to the magnificent livestock, wonderful food and drink, inspiring flower and garden displays, stalls offering a wealth of goods, there is wholesome entertainment in six rings – flying motorbikes, falconry on horseback, a horse whisperer, scurry driving, axe racing, vintage tractors, steam engines and dog agility to name but a few. June – A celebration of the village’s history, with local strawberry-growing dating back hundreds of years. There are usually about 20 stalls, selling locally grown strawberries, crepes, pancakes, scones, clotted cream, cakes and pasties. With raffles, face-painting and toy stalls. 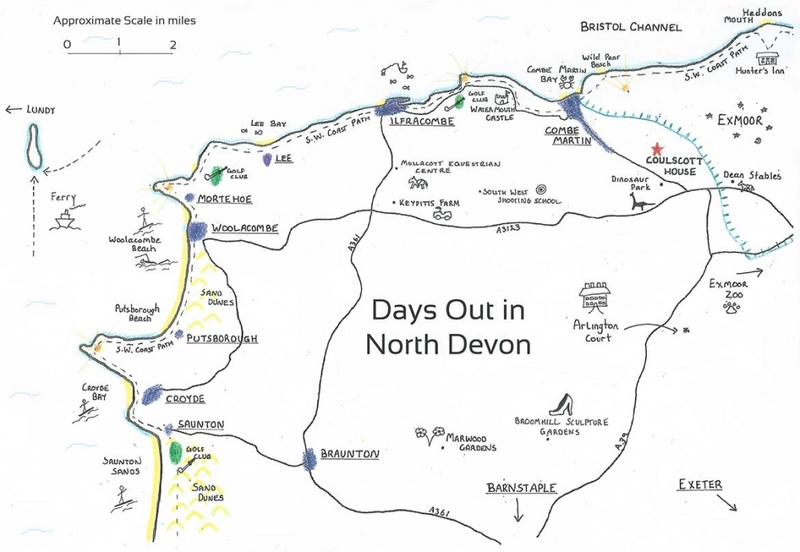 Recognised as being one of the top five events in the country by The Times, the North Devon Festival is a celebration of the rich cultural life of the area with dance, fairs, art, lifestyle, sport, theatre, comedy, and nature events happening throughout the area over the month of June. Starts first weekend in July for 4 consecutive weekends – The festival starts on the first Friday in July with live music and events every Friday, Saturday and Sunday for four consecutive weekends, and also some midweek events. The festival has something for everyone, with music for all ages and tastes. Second week of August – The week starts with the crowning of the carnival queen and includes the huge main parade, wheelbarrow race, raft race, live music and events for all ages. The main parade is always an evening of excitement and fun, attracting thousands of onlookers and featuring a long procession of colourful and imaginative floats. The floats, varying in size, theme and history, are what make the Combe Martin Carnival stand out from others. These include many from local businesses and villagers and some, like the ‘Uncle Tom Cobley’, which have been entered into the parade since 1911. The parade starts at the top of the village for judging and finishes at the seaside where the party begins. Carnival week concludes on the Friday night with a spectacular fireworks display.